THE TRUE THREAT OF GRASS! Well sir, if you’ve followed what few trinkets of WTF moments I’ve passed your way, what you may have noticed is a funny little trend. That is, what was once old is new again, or, problems/controversies of the past are also problems/controversies of the present. Keeping in this similar vein is our current entry. The Joker. Batman’s arch nemesis, a character that easily rivals any of the “good guys” in comics in terms of recognition and popularity. His origin is a classic, a desperate criminal plunges into the murky depths of a chemical vat to avoid capture by the grim avenger, and later emerges with chalk white skin, green hair, and a permanent grin stuck on his face. This twist destroys his mind and he thus becomes the most feared and violent madman Gotham City has ever known. But is that how it really happened? Couldn’t there have been other extenuating circumstances that led to this tragic series of events? 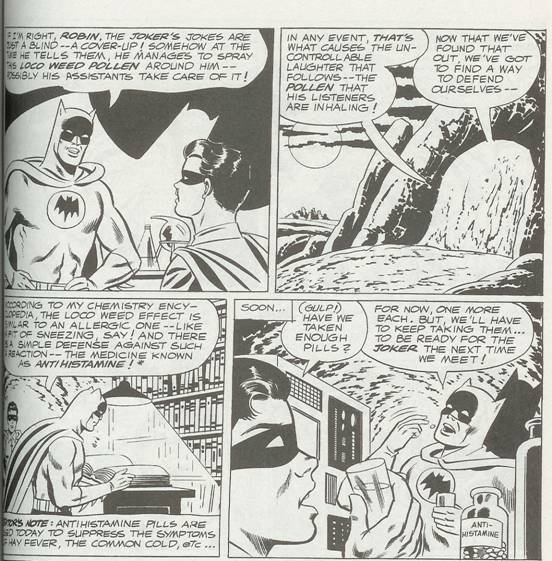 I first came across this idea while reading the Batman Showcase trade available for sale, and in particular, Detective Comics #332 from 1964/5. Aha, but shortly after his latest theft, Batman and Robin are at the turning point! 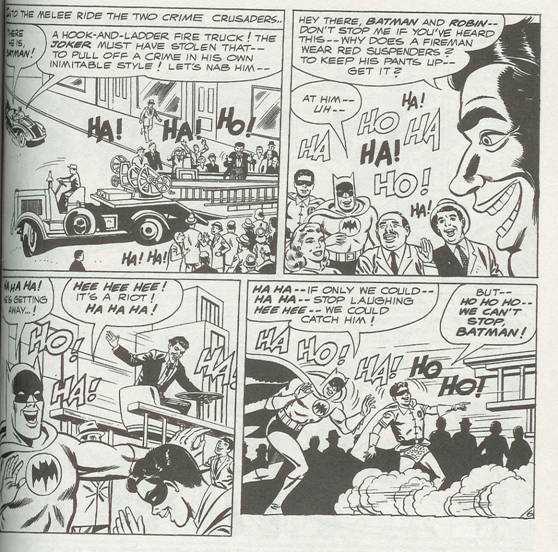 There you have it, the Joker used Loco Weed to cause everyone to laugh. I wonder if, besides laughing at everything stupid, Batman and Robin also noted “the munchies” in their list of symptoms? Maybe they stopped for a Bat-Burger on the way home? 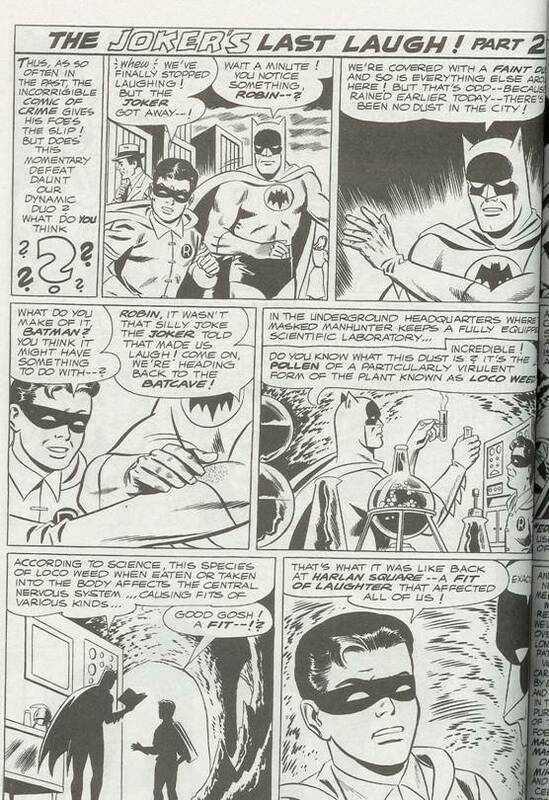 Speaking of public service, on the very next page Batman and Robin discover the cure for marijuana exposure. I kid you not! That’s right, just take some Sudafed or any other allergy medication, and your right as rain! Toke all you want in the morning, but still be sharp enough for the morning office meeting! I’m a little worried about Batman and Robin though. They say Marijuana is a gateway drug, and here are the caped crusaders downing pill after pill after pill. Robin says it right there “Have we taken enough pills?” You’re only supposed to take 2 at once! Someone get a stomach pump!!! I nearly spit out my Kool-Aid when reading this. I don’t know what’s more disturbing, the first line Supergirl says, or the fact she’s using her Super-Vision to spy on her new boyfriend! Perhaps one of the creepiest thought balloons from the wholesome hero age.